East of Zuma Beach at the new Native Hotel, cinder block bungalows are awash in cool whites and natural woods. Custom bathrobes made from brilliant African cotton prints hang from burnished copper pipes, and the amenities tray offers a bundle of sage and toothbrushes that have been infused with Japanese binchotan charcoal. The silver Airstream trailer parked out front is set to become a coffee-and-waffles stand overseen by chef Ludo Lefebvre. Out back is a minimalist-chic wellness room, where yoga sessions and aromatherapy massages take place behind sliding barn doors. 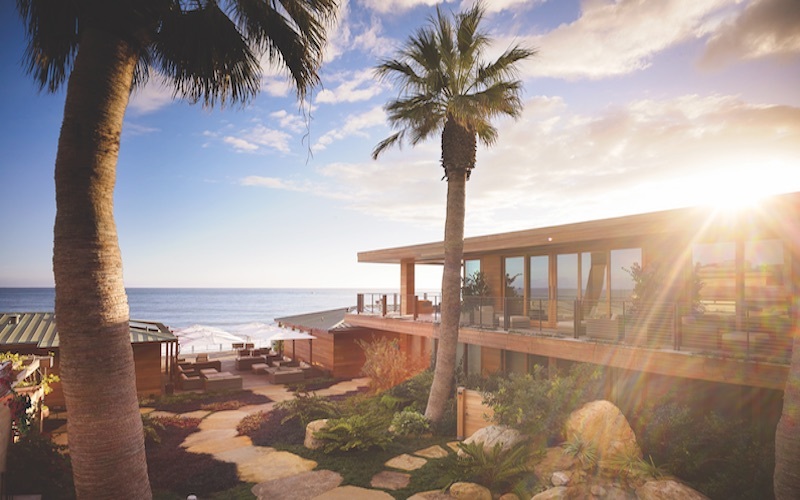 Fetching $359 a night, the Native may seem in keeping with the area, but the stylish little hotel is a rarity in Malibu. Locals have been notoriously resistant to visitors since May Rindge, owner of the original Rancho Malibu, chased them off with a shotgun. While roughly 15 million tourists passed through Malibu last year, there are just six hotels and motels, offering a mere 130 rooms. The California Coastal Commission staff has noted that the city is a severely underserved area for overnight accommodations, but several properties are trying to improve on the options available. “Malibu has always been an internationally known destination. Everyone wants to be here, but there’s almost nowhere to stay and not many places to go,” says Shaun Gilbert. He’s a managing partner at SKG, the Santa Monica investment group that transformed the slumping, 70-year-old Malibu Riviera Motel into the Native. Last March the Malibu Beach Inn completed a top-to-bottom renovation. Owners Simon and Daniel Mani, whose property investment group owns the Soho House building in West Hollywood, paid the previous owner, David Geffen, a reported $80 million for the Carbon Beach hotel in 2015. Now room rates start at $495. That and another $1,000 will almost buy you a night at nearby Nobu Ryokan Malibu, the 16-room Japanese-style inn that debuted in April. As you stand in the lushly planted courtyard, surrounded by expanses of teak, stone, and glass with waves lapping the front deck, it’s hard to remember that the Ryokan was the bland Casa Malibu Inn before tech billionaire Larry Ellison bought it for a reported $20 million and teamed with chef Nobu Matsuhisa’s hospitality group. Up the street another makeover rolled out in September. Some $10 million has gone into revamping the Surfrider, the vaguely Tudor hotel that looks onto the pier (rates start at $325). “The building wasn’t so glorious, but the location was,” says Matthew Goodwin, a co-owner and architect who grew up surfing across the street. Changes include the addition of a rooftop restaurant and bar and outfitting each room with plush linens, teak floors, and a hammock-equipped terrace.